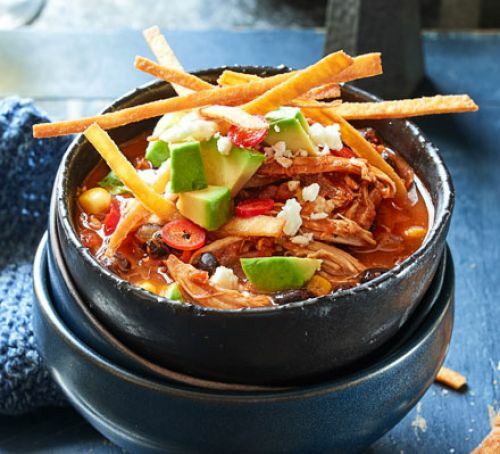 Tortilla Soup - Hello everybody, welcome back with ZetiraKitchen! Today I will share about How to Make Chicken Tortilla Soup. This dish so easy to make. they has yummy flavor, and so many filling! Serve with warm corn bread or tortillas. You can add with fresh avocado,crushed tortilla , and green onion. Put many beans, and use vegetable broth. this soup is rich of beans, veggies, and broth. If you a soup lover you should try to taste. Let's try it! Put the vegetable oil into large saucepan heat. Add the onions then stir fry until smelled. Then add the garlic and jalepenos. Take the pot and pour the chicken broth, tomatoes and beans. Boil until the ingredients boiled. Set in low heat then add your chicken breasts. Cook the chicken for 20 to 25 minutes. Once chicken is cooked remove from pot. Let sit until cooled. Add lime juice and fresh cilantro to the pot. In a bowl add a mound of shredded chicken. pour the soup over chicken. On top of soup give with a lime wedge, grilled tortilla strips, avocado slices and cheese.